Janome HD3000 Review (April 2019): Good or Bad? See Details! Who wants to know the real stuff about Janome hd3000 sewing machine? If you are looking for a Janome hd3000 heavy-duty sewing machine, you're in luck! In this Janome hd3000 review, we'll objectively inspect this model's capabilities. More on this later. 3 Is pressure on presser foot adjustable? 4 Does it have a free arm? 5 Does it come with a hard cover? 6 What are the accessories included? 7 What Presser feet it comes with? 8 Is there any storage? 9 What type of bobbin system does it come with? 10 How many stitches and how to select those﻿? 11 Is there any stitch selection guide on the machine? 12 Can I adjust stitch length and width? 13 What about the Buttonhole stitch? 14 What kind of fabrics can it handle? 14.4 Can it sew through heavy duty leather? 14.5 Will It sew thin material like silk? 14.6 How many layers of denim can it handle? 15 Do you need to oil the machine? 16 Can I use it for commercial purpose? 17 Who is the Janome HD3000 best suited for? 20 Is this machine heavy? 21 Should you go with a digital Or mechanical model? 22 Where are the Janome HD 3000 machines made? 23 Does this machine have an extra high presser foot? 24 Can it be used as a serger? 26 What about multiple needle positions? Janome is a brand that has built a legion of steady fans over the years, and the Janome HD 3000 is one of the reasons why. This mechanical machine is designed for both durability and versatility. It's intelligently engineered to deliver the kind of quality work that even the most experienced seamstress would appreciate. And it's simple layout and ease-of-use makes it a solid choice for the beginners too. Sewing is not just a useful and practical skill; it's also a wonderful creative expression. The Janome hd 3000 sewing machine is so versatile that it’s made for people of many skill levels. Aunt Sally, even grandpa Barney can use this sewing machine in several useful and creative ways. If there are several users (or potential users) in your family, this machine will make an excellent choice. When you check out the Janome HD3000 reviews online at Amazon, you'll notice that it's become a popular mechanical sewing machine. This one has many things you'd expect from a reliable sewing machine, with the additions of 1) a needle threader 2) an onboard thread cutter. These built-in assets are most useful indeed. You won’t often find them on mechanical sewing machines as standard features. Here are some of the questions you might have about this 18 built-in stitch machine from Janome. Is pressure on presser foot adjustable? Yes, it is. Adjustable pressure on the presser foot is controlled just by turning the dial. It's especially useful for sewing different types of fabric. The adjustable presser foot pressure makes this machine accommodating for many types of fabrics. It doesn't matter whether you're working with thick fabrics or thin. You decide how little or how much pressure to apply. It can take some practice here to get things just right. Set pressure dial to one or two while working with light weight fabrics like lace and chiffon. Adjust the dial to three for regular sewing garments. Does it have a free arm? Surely, just slide off the storage compartment to access the free arm. With free arm capability, it’s much easier to sew shirt sleeves and pant legs. Does it come with a hard cover? Yeah, it does. A protective hardcover for the machine makes it easier to move around your house while having all the essential parts and pieces with you. It is only a cover which sits on the top of the machine and allows you to access the handle of the machine to move it around. However, there is no protection on the bottom of the machine. What are the accessories included? And then all those other parts that round out the contents of the box while adding extra value. Among these parts are a spool holder, lint brush, screwdriver, additional spool pin, seam ripper, bobbin, power cord, foot control and instruction manual. What Presser feet it comes with? Mostly there are five snap-on presser feet included, The Ultra Glide Foot may or may not included depending upon the package you purchase. Yes, it got a storage compartment built in near the bobbin holder. All the accessories fit into the storage area, which is extremely convenient. With everything you need for your project right there in front of you, sewing becomes a lot more fun. What type of bobbin system does it come with? Incorporated into this model is a jam proof full rotary hook bobbin system. As the bobbin gets dropped into place, it is then covered with a transparent plastic housing. It enables you to easily see how much thread you have left at any particular point in time. How many stitches and how to select those﻿? There are 18 stitches at your disposal. You can choose whatever stitch you like by simply turning the dial. The dial control is easy and precise. As you switch from one stitch to another, a small light illuminates under an image of the actual stitch to verify your selection. Is there any stitch selection guide on the machine? Whenever you lift the lid of the hd3000 Janome, a handy instruction/guide panel is right there at your fingertips. So if you’re unsure of which presser foot to use in any particular situation, the guide will serve as a quick reference tool. Follow the recommendations, and you should be good to go. It is particularly useful for beginners and equally helpful for more experienced sewing enthusiasts who want to double-check before proceeding with a stitch they rarely use. Can I adjust stitch length and width? Beside the stitch selection guide are the sliders to control the length and width. The top slider controls the width of the stitch, while the lower slider is used for adjusting the length. What about the Buttonhole stitch? The “One-Step Buttonhole Maker” that works well to create good buttonholes. But frankly, it’s a little inconvenient because after each buttonhole has been stitched, the sensor needs to be reset. That’s something that could be improved. Hopefully, the manufacturer takes note of this and incorporates an upgraded system on future iterations of the HD3000. The overall quality of the stitch produced by this machine is excellent. You get reliable, long-lasting, well-formed stitches you can count on - time after time. What kind of fabrics can it handle? Percale, Linens, Pique, Cotton, Serge Double Knits. Drapery, Denim, Tweed, Coating, Gabardine and Upholstery fabric. Can it sew through heavy duty leather? Although you can sew through faux leather and other thin leather garments, you should avoid using Janome HD3000 for industrial grade leather. Here are more options for leather sewing machines. Will It sew thin material like silk? Yes. You can sew silk, chiffon, Lycra and more with the HD 3000. What's of vital importance here is that you use the right needle and try a walking foot. And you should always test your results on a scrap piece of fabric, first. It enables you to make the correct adjustments in pressure and tension as needed, so your project turns out flawless. How many layers of denim can it handle? It can handle up to eight l﻿ayers of denim. Do you need to oil the machine? No, this machine doesn't require any oiling as per manual of the machine. Maintenance is easy with the Janome HD 3000. You just clean the hook race, feed dogs and bobbin after each use. You can also wipe the head clean with a soft dry cloth as required, or use a damp cloth whenever it's necessary. It means you should have your machine serviced once a year if you're using it on a regular basis. As with any piece of electrical equipment, it's a good idea to have it serviced by a qualified repair professional. It will give you peace of mind that any maintenance work completed is done properly. It’s also pretty much a given that this will extend the life of your sewing machine. Treat your new sewing machine as a valuable tool, and you're much more likely to enjoy more years of reliable service from it. Can I use it for commercial purpose? No. It should be noted that this machine, although called a "heavy-duty" sewing machine, is not meant for commercial use. It's intended to be used in a home setting only. So if your machine is being used for extended periods of time, or used heavily day after day, you will need to service it accordingly. But don’t expect it to last for years if it’s going non-stop. That’s NOT what it was designed to handle. As with any piece of equipment you should never force anything. If there appears to be any problem, or weird sound coming from your machine, consult your manual as a first step, before talking to a service professional. That applies to whatever brand of machine you ultimately settle on. Who is the Janome HD3000 best suited for? This machine is best used by families who have multiple people who might want to use it at various times. It's excellent for beginners - even children in elementary school getting their first taste of sewing and working with fabrics. A quality mechanical machine is always the best to learn on, and this one is rock-solid. It's equally good for intermediate and advanced home users because of its versatility, stability and the fine quality stitches it produces. The hd3000 from Janome is a stable sewing machine built from a heavy-duty aluminum frame. This is the foundation of a sewing machine. If the frame is inadequate, it doesn’t matter about all the bells and whistles the manufacturer adds to it. Handy on board tutorial and reference guide you can refer to whenever you get stuck. This is quite useful and is always just a flip away. It efficiently produces stitches that are polished. That’s what makes it a favorite among experienced seamstresses. It’s not a digital machine, and yet it’s easy to use, and the end result is top level. The design of the machine is of vital importance. It needs to be user- friendly, and that’s certainly the case here. All settings are easily accessible and provide precise control to the operator, which is exactly what you want from a sewing machine. The reverse lever is another excellent feature. This Lever is located at the front of the machine and therefore, is readily accessible at any time. Experienced users like this because it makes it easier to reinforce different stitches quickly. Control is another great benefit offered here on the HD3000. The electronic foot control is ideal when you're working with thicker and more resistant fabrics, and it’s easy to use. You won't strain your eyes anymore with the automatic needle threader. If threading a needle has frustrated you in the past - those days are about to be history. The top loading bobbin system is a beautiful thing because it's jam-proof. The dials on the Janome get two thumbs up simply because they give you precise control and delivering results you can be proud to call your own. The HD 3000 Janome is a beast with its variable speed motor controlled by foot pedal. It is capable of delivering 860 stitches per minute. There is no problem in switching between light and heavier materials. It simply takes it all in stride and other minor adjustments. Seven piece feed dog system help you smoothly feed different types of fabrics. The manual tension adjustment is not that handy. But then again it a mechanical machine not a computerized one like Janome 8077. While some parts on the Janome are indeed plastic, the body of the machine is made of metal. What you're getting is something that was designed for performance, durability, and economy. To make everything out of metal would add to the weight and of course, the cost. The built-in lighting system is of a somewhat lesser quality. The light provided is dim, making it difficult to use the machine in the evening, without additional lighting sources pointed directly at the worktable. ​The worktable is compact. Unfortunately, this limits the flexibility of the HD3000 regarding the size of the fabric you can easily handle. You can purchase the extension table from sew steady that will increase your workspace﻿﻿﻿﻿ for ﻿﻿﻿bigge﻿r projects. The cord on the foot pedal is a bit short. If you're working at a bar type height, or a table that is slightly taller than normal, the cord won’t be long enough. It seems like it would be an easy and inexpensive fix on the manufacturer’s side. It’s neither heavy nor light. At 18.7 pounds, this isn't the lightest sewing machine on the market, although it's a whole lot lighter than the machines of yesteryear. To make this sewing machine any lighter, I suspect more parts would need to be fabricated out of plastic, and that's not usually a good thing. When you look at it, you come to realize that it's a full-size sewing machine. Its adequate weight ensures relative stability. You won't have to worry about the machine dancing around on the table as you're trying to use it. And the quality of the stitch it delivers on virtually all types of fabric is top-notch. Should you go with a digital Or mechanical model? Mechanical sewing machines are the best to learn on, and a good-quality machine like the HD 3000 is super easy to navigate. With a mechanical machine, you don't have to worry about the sometimes complicated options available on digital cousins. While digital sewing machines are often advanced and have some nice features, they are not without their pitfalls. One common problem is that the digital display can break, rendering your machine “out of service”. Another issue is that the text itself is difficult to read. Many people who have used both but learned to sew on a mechanical machine, prefer the simplicity of the older style. They prefer hand dials to a touchpad or buttons. There's also the issue of what happens when your digital sewing machine breaks down? Like a car, it's not a simple fix that you can repair in a few minutes time. It requires sending your machine to the factory to have it fixed by a pro, which is often cost prohibitive. 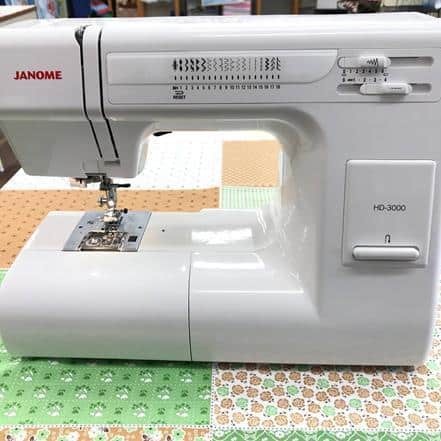 Where are the Janome HD 3000 machines made? Unlike most consumer goods these days, Janome sewing machines are manufactured in Taiwan/Japan. It's a sign of the quality from Janome. This one is made in Taiwan. Does this machine have an extra high presser foot? Indeed it does. It's this extra high presser foot that enables you to work with heavy fabrics and multiple layers. It's the kind of thing that your average home sewing machine would struggle with - but the HD 3000 makes it easy. All presser feet snap in and are locked into place. It's also quick and easy to change them as needed. You can quickly switch from a straight stitch to a blind him without needing any screwdriver or special tool. Can it be used as a serger? Unfortunately, no. There is no serge feature on this device. What is offered is a built-in stitch called “Overlock.” This is essentially a hybrid zigzag stitch. Although it's able to sew through many kinds of material, this sewing machine is actually on the quiet side. Any device with a motor is never going to be silent. What about multiple needle positions? This machine has two needle positions. Left and standard middle position. However, it doesn't have the right position for the needle. Overall, most people are quite content with the quality and durability of this machine. HD3000 is easy to operate, and it can be used for the variety of sewing projects to produce professional quality results. This one’s a winner. If you can't afford this machine, Janome Magnolia 7318 is another good option to consider. If this is not what you are looking for, you can read about the best Janome sewing machine reviews here.